The young man walks fast by himself through the crowd that thins into the night streets; feet are tired from hours of walking, eyes greedy for warm curves of faces, answering flicker of eyes, the set of a head, the lift of a shoulder, the way hands spread and clench, blood tingles with wants, mind is a beehive of hopes buzzing and stinging, muscles ache for knowledge of jobs, for the roadmaster’s pick and shovel work, the fisherman’s knack with a hook, the swing of the bridgeman’s arm as he slings down the whitehot rivet, the engineer’s slow grip wise on the throttle, the dirtfarmers use of his whole body when, whoaing the mules, he yanks the plow from the furrow. The young man walks by himself searching through the crowd with greedy eyes, greedy eyes taut to hear, by himself, alone. The streets are empty. People have packed into subways, climbed into streetcars and buses, in the stations they’ve scampered for suburban trains; they’ve filtered into lodgings and tenements, gone up in elevators into apartment-houses. In a show-window two sallow window-dressers in their shirtsleeves are bringing out a dummy girl in a red evening dress, at a corner welders in masks lean into sheets of blue fame repairing a cartrack, a few dumb drunk bums shamble along, a sad street walker fidgets under an arclight. from the river comes the deep rumbling whistle of a steamboat leaving dock. A tug hoots far away. The young man walks by himself, fast but not fast enough, far but not far enough (faces slide out of sight, talk trails into the tattered scraps, footsteps tap fainter in alleys); he must catch the last subway, the streetcar, the bus, run up the gangplanks of all the steamboats, register at all the hotels, work in the cities, answer the wantads, learn the trades, take the jobs, live in all the boarding houses, sleep in all the beds. One bed is not enough, one job is not enough, one life is not enough. All night, head swimming with wants, he walks by himself, alone. Only the ears busy to catch the speech are not alone, the ears are caught tight, linked tight by the tendrils of phrased words, the turn of a joke, the singsong fade of a story, the gruff fall of a sentence, linking tendrils of speech twine through the city blocks, spread over pavements, grow out along broad parked avenues, speed with the trucks leaving on their long night runs over roaring highways, whisper down sandy byroads past wornout farms, joining up cities and fillstations, roundhouses, steamboats, planes groping along airways, words call out on mountain pastures, drift slow down rivers widening to the sea and the hushed beaches. 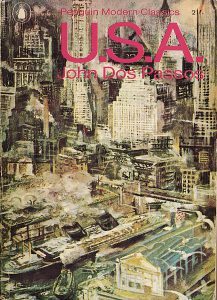 CategoriesFriday reading Tagsinequality, John Dos Passos, literature, U.S.A. Previous PostPrevious Holy Chapter 11, Batman!